Doing the Lord’s work is solemn, serious business—at least according to most films about monks, missionaries, and other devout devotees of The Word. But The Flowers Of St. Francis, directed by the Italian master Roberto Rossellini and co-written by a young Federico Fellini, breaks dramatically from that cinematic tradition. Both earthy and whimsical, it presents the holy life as one of sacrifice and routine, but also of friendship, of hearty meals, even of comical misadventure. Though focused on the life of a real religious figure, and loosely based on two ancient accounts of his work, Flowers rarely resembles a conventional biopic. 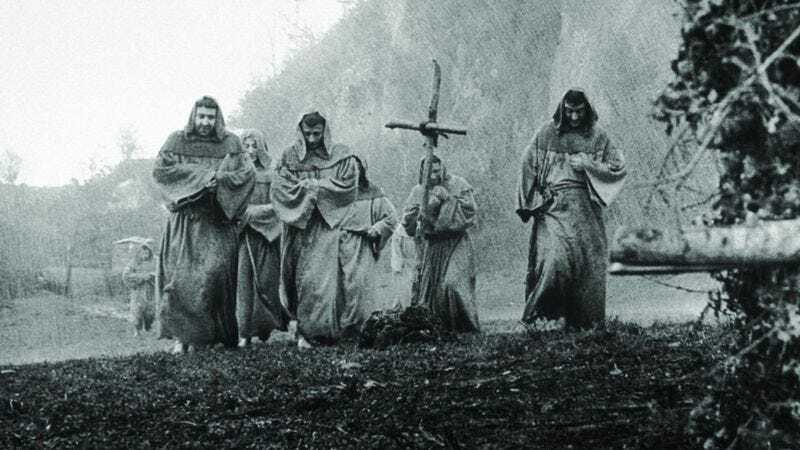 Divided into nine vignettes, each granted its own chapter heading, the film zeroes in on an order of friars, roughing it in the wilderness and learning the tricks of the trade from an already-famous St. Francis. The tone is playful, the mood inviting, the moral lessons casually conveyed. It’s a 13th-century hang out movie, featuring gospel messengers whose company a heathen might gladly keep. A noted nonbeliever himself, Rossellini was nevertheless fascinated by the ethics and practices of Christianity. Flowers often plays like an admiring tribute to the ideal of a good Christian man, celebrating principles of selflessness—of finding happiness in helping others and in enduring hardships in the name of faith. Casting real Franciscan monks as the film’s friars, and accepting funding from the Vatican, Rossellini treats the values of his committed characters with utmost sincerity. But he’s also not afraid to locate goofball humor in their daily exploits: One follower keeps donating his tunic to the needy, finding loopholes in his strict instructions not to, while another becomes the living jump rope for a group of barbarians. Neorealist that he is, the director frequently focuses on mundane tasks, pleasurably attended to by the men. There is splendor too: In the film’s most poignant vignette, St. Francis is divinely humbled by his encounter with a leper. The moment, staged by an avowed atheist, conveys a powerfully religious awe. In tackling the teachings of a man he considered “The Jester Of God,” Rossellini made a devotional film that’s never preachy and always endearing. That’s an accomplishment worthy of worship. Availability: The Flowers Of St. Francis is available on Criterion DVD, which can be obtained from Netflix, and to stream on Hulu Plus or (for free) on YouTube.